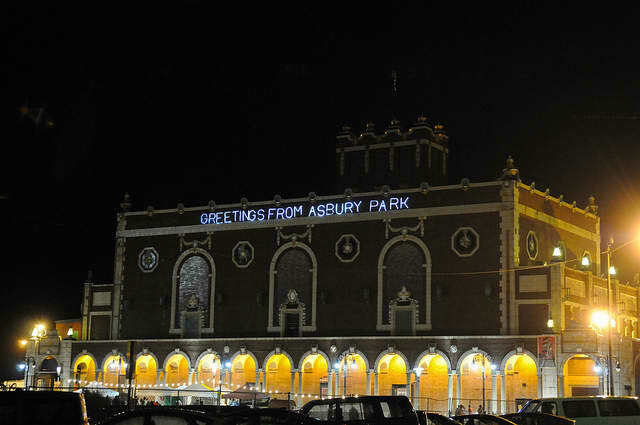 It is impossible not to mentally conjure Bruce Springsteen when in Asbury Park. Like Straford-upon-Avon exists only to hold the legend of Shakespeare, and East Egg as a town has myth just because of The Great Gatsby. But it's different when you have your boots on the ground (and you need them—it rains a lot in Asbury Park). Springsteen apparently still has a place in town, but to visitors his presence is tenable at best, permanent mostly in paraphernalia. Whether or not it ever was, Asbury Park is not currently a classic American city, with yellow ribbons tied around old oak trees. It does have a beautiful beach, a lot of immigrants and some cheesy new buildings, the mixture of overgrown and newly propped up feeling like the strange mix that attracted British journalists and French philosophers to our shores. All Tomorrow's Parties, the UK festival come stateside, moved from upstate New York to the Jersey Shore this year, taking over a corner of Asbury Park's boardwalk, specifically three buildings, the adjacent old Paramount Theater, the cavernous Convention Hall and Asbury Lanes, a very retro bowling alley. All three hosted performances for three days, an amalgam of bands curated both by the festival organizers and the gloomy group Portishead. For a wet weekend, Portishead's love of melancholy was possibly appropriate, though there was little room for revival with groups like Swans and Earth as big draws. Portishead performed two nights, as did Neutral Milk Hotel's Jeff Mangum, alone on a big stage to an audience geeking just at the sight of him. To be frank, the lineup was not the hugest draw—the match up between Asbury and an influx of people who like emotionally heavy music was. And a lot of people just came to see Jeff Mangum. The FADER staff attended en masse—our highlights from the long weekend are below.